SCVHistory.com LW2776 | Film-Arts | William S. Hart, Arcade Card ~1926. 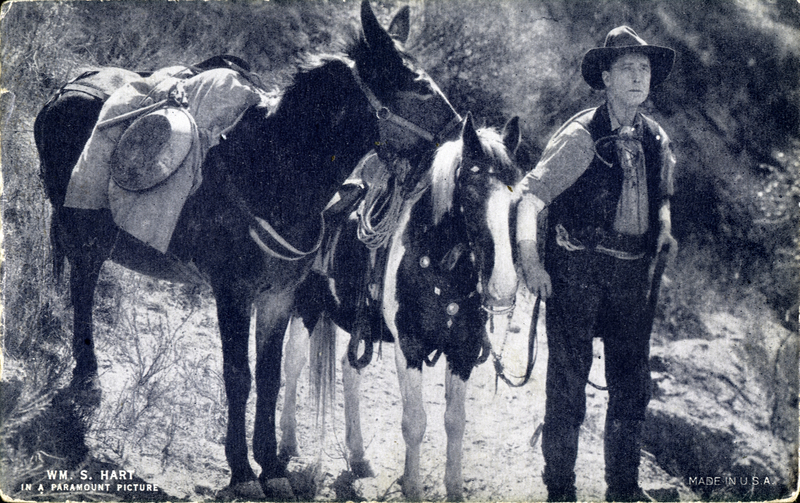 "William S. Hart in a Paramount Picture." Arcade card, circa 1926. The one-sided, 3&frac38;x5&frac38;-inch card is undated, but 1926 is likely because that is when the Exhibit Supply Co. of Chicago printed arcade cards in blue-gray and included the text, "Made in U.S.A."
If we're right about the date, Hart's film career was over by the time this collector card was issued — but he didn't know it, and it wasn't by his choice. LW2776: 19200 dpi jpeg from original arcade card purchased 2015 by Leon Worden.